This fascinating account follows the wartime experiences of Phillip Gunn, who joined the Royal Navy in 1911. At the outbreak of war he was serving on a sloop, HMS Clio, in Singapore. Sent to the Persian Gulf to protect British interests, they eventually ended up in Mesopotamia. With the Clio armed with 4” guns, they headed to Qurna to provide gun support for the army and deal with any Turkish vessels. Leading the Indian Expeditionary Force up the River Tigris, they then advanced further upriver to Amara, taking out Turkish strongholds along the way. Gunn was then transferred to a flat-bottomed paddle steamer, required to negotiate the narrow waters they were encountering. The boat was part of General Townshend’s motley regatta, who with an assortment of boats and just 50 men, captured Amara unopposed, taking 2,000 Turkish soldiers prisoner. The advance continued upriver towards Baghdad. Gunn was again engaged in supporting the troops in the Battle of Ctesiphon. However during the battle he fell unconscious, succumbing to the effects of malaria. He was sent back to Kut, but due to the medical services being overwhelmed was returned to his ship at Basra. His illness was to be his saving grace; in the retreat from Kut the boat he had been on was hit and sunk, with the loss of all the crew. However, this fate was perhaps better than that suffered by those besieged at Kut, who surrendered in April 1916 and were marched to Turkey, a march that cost many of them their lives. Phillip was awarded the Distinguished Service Medal for his actions during the advance on Kut, and later served in the Second World War, but this aspect of his life is not described in any detail. The book is based on the diaries and memoirs of, and conversations with, the subject, who was the author’s father. However the diary entries themselves are not reproduced, rather a narrative is used which recreates many of Phillip’s conversations. Whilst the style is very readable, personally I would have preferred seeing the diary entries or memoirs perhaps with additional notes to give context or extra information. An added bonus is the colour reproduction of many of Phillip Gunn’s paintings of the events portrayed in the book, which he painted later in life. These wonderful pictures capture the day to day life on board the Clio, as well as some of the more dramatic events covered in the book. The Mesopotamia campaign remains an understudied aspect of the war – at least in popular literature – and the book highlights some of the difficulties of the campaign, notably the poor supply lines and lack of medical facilities, crucial in a theatre where half of the deaths were caused by disease. 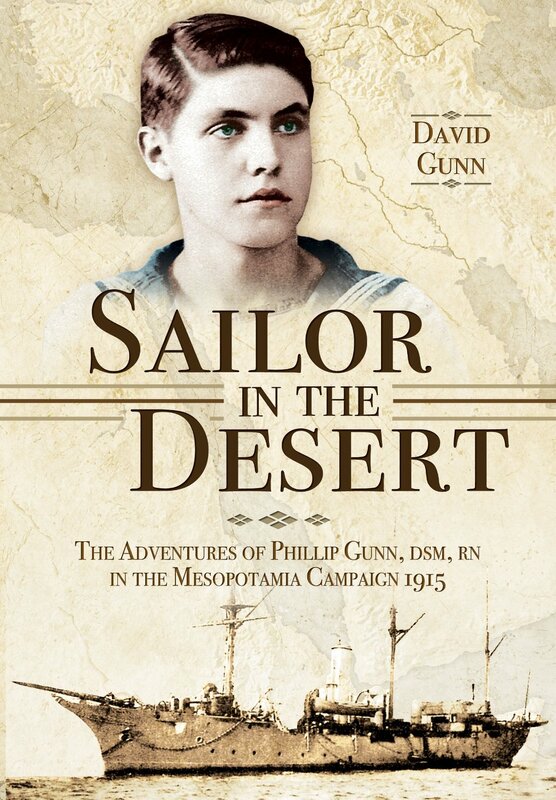 The short chapters also provide an interesting insight into many aspects of the sailor’s life, and are possibly a unique account of this particular aspect of the Mesopotamia campaign.